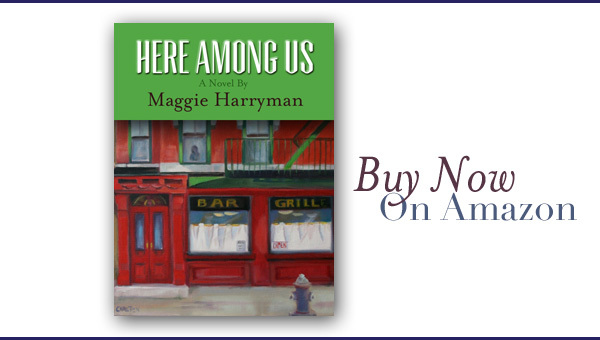 “Here Among Us, by Maggie Harryman, is a book I couldn't put down. Flynn and her college-ready daughter, Didi, fly east for a Thanksgiving family reunion, a holiday during which the family comes together, falls apart, and ultimately comes together again—the same but forever changed. The O'Shea children grew up helping their late father and still very much alive mother run an Irish pub and restaurant in New Jersey, and the connections forged in that pub are still the important connections in their lives. Flynn, whose story this is, has fled this scene for San Francisco but finds herself drawn back into all the old currents of love and strife she thought she'd left behind. Here she reconnects with Michael, whom she didn't choose first time around, but with whom she finds herself getting a second chance, a chance she's not sure she's ready for. — Robin Beeman is the author of three works of fiction: A Parallel Life and Other Stories, A Minus Tide, and The Lost Art of Desire. Unemployed San Francisco attorney, Flynn O'Shea, and her teenaged daughter, Didi, are summoned to New Jersey for the Thanksgiving holiday by Flynn's socialite sister, Maeve. Needless to say, Flynn expects a fight. After all, she has been battling Maeve most of her life. Disagreeing about the extent of their Irish mother's creeping dementia and the fate of the family's thriving restaurant business, named for their beloved, long dead father, Paddy, is surely a recipe for a world-class brawl. What Flynn doesn't expect is the fragile truce the sisters forge to save O'Shea's from the clutches of Maeve's scheming husband, Jeffrey. Flynn and Maeve are reluctantly aided by their forty-four-year-old brother, Osheen, a handsome Peter Pan still cruising the Jersey shore, getting high and dodging responsibility. And while Didi tries to convince her mother that “everything is as it should be,” just when Flynn is sure she's gained the upper hand on Jeffrey, her own mother's shocking confession sends her into a wine-soaked tailspin and forces her to deal once and for all with the ghosts of her past. Devastated, Flynn must choose to save O'Shea's or risk losing forever all she has left of her father. In Here Among Us, the O'Sheas find themselves dealing with the very timely issue of Alzheimer's, a disease that strips the victim's identity and wreaks havoc on the family left to pick up the pieces. But Flynn, Osheen and Maeve's troubles began long before their mother started to “slip.” For the O'Sheas, much of their shared angst is rooted in the single most devastating event of their lives—the death of their father when they were young children. The novel explores not only how deep wounds can seem impossible to heal but how refusing to let go of the stories they desperately cling to about who they are threatens to hasten their demise.